I wonder about the strangest things sometimes. Like most people, I keep a bath mat in front of the tub. As often as not, I use one of those terry cloth mats, which is like a thick towel. When I let laundry get behind, sometimes I resort to using a regular bath towel on the floor. Recently, I put down an old towel that was larger than a hand towel, but not quite the size of a standard bath towel. It worked just fine. Plenty of room for feet while drying off after a shower, not so large as to require folding to fit in the allotted space, but not quite the size of a bath mat. It was at this point I got to thinking about perspective. If a real bath mat is fine, and a folded towel works just OK, is this mid-sized towel acceptable? What if I put down a hand towel? How about a washcloth? At what point does a replacement become too small for it to be taken seriously? 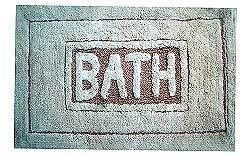 At what point would a reasonable person, see this piece of cloth on the floor and fail to see it as a bath mat? Would they think it was a bit of laundry which had fallen and been neglected? Would they pick it up and put it in the laundry basket? This is where the parallel to real life dawned on me. I often think of, but too readily forget to practice, the saying, "Be the labor large or small; do it well or not at all." At what point does the effort I make at things, become so small as to become something else entirely? And is it necessarily a bad thing, if I realize I am doing it? How will my works be perceived by others? Will it be viewed as some effort below the acceptable level of performance for that task, or as something completely different than what I had intended. 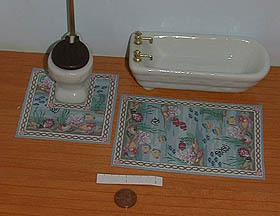 As with the washcloth on the floor, which may be a perfectly good washcloth, but a poor bath mat. When I do things without giving them my best effort, am I trying to substitute a washcloth for a bath mat? Perhaps more importantly, will there come a time when I begin to accept less from myself as acceptable?